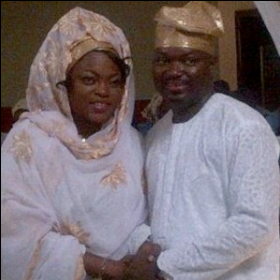 Talented Nollywood actress,Funke Akindele and fiancé,Kehinde Oloyede Almaroof have started their journey into matrimony today Thursday,May 24,2012 as they staged a classy Nikkai at the bride’s parent home. The ceremony attracted only close family members and friends. Until now,no one,especially media has had an inkling of the romance between Funke and Kehinde Almaroof especially since her once sizzling romance to popular actor,Femi Adebayo crashed. Almaroof is popularly known as Kenny Doo on the Lagos social scene. The popular socialite owns a couple of properties in Lagos,especially around the Oshodi/Bolade axis.He is a son to a popular Market Woman Leader(Iyaloja) in Oshodi. His mum Alhaja Taiwo Almaroof was a councilor during the UPN days and a one-time woman leader of the Peoples Democratic Party(PDP) in the Oshodi/Isolo zone. Findings revealed that Kenny who is in his late 30s,is already married,but he’s going the whole hog in marrying Funke,who he has been dating for some time now. 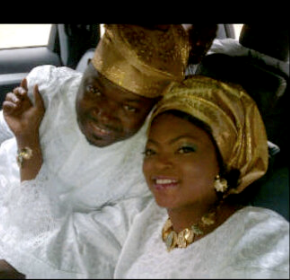 Their engagement ceremony will hold at All Seasons Plaza Agidingbi Ikeja on Saturday May 26th.